Implement a client library for communication. Using this approach, Baratine can transform an existing library or application into a standalone web service. The Baratine services will communicate with the existing library, and the Baratine clients will service requests from the outside world. In this article we will explore an example of using Baratine to expose Apache Lucene, the popular open source Java search library, as a high performing web service. Acts as an asynchronous messaging service. Exposes a public WebSocket API for Lucene. Is deployed to a standalone managed server. Task 1. Publishing an HTTP/WebSocket Client API. Task 2. Bridging Lucene's synchronous library to asynchronous Baratine services. Public API service: Responsible for proxying method requests to Lucene library. Lucene Reader service and writer service: Responsible for reading and writing search indexes, bridging between Lucene's synchronous/blocking API and Baratine's asynchronous/messaging. Baratine Lucene Client: Coded for our example, exposes Lucene client method functionality, used for Browser results. LuceneFacade is the API for the published HTTP/WebSocket, accomplishing the first task. Its implementation is LuceneFacadeImpl. The published API is asynchronous, using Baratine's Result as a callback holder for the result. The implementation is single-threaded and non-blocking, eliminating the need for synchronization. LuceneReaderImpl implements the search query service, which bridges between Lucene's synchronous library to Baratine's asynchronous APIs. Because Lucene's search is multi-threaded and blocking, LuceneReaderImpl uses Baratine's multi-worker support (@Workers). The multi-worker support is similar to a database connection pool. Users of LuceneReader see an asynchronous service without needing to know that is implemented as a multi-threaded service. LuceneWriterImpl implements the index updating service. 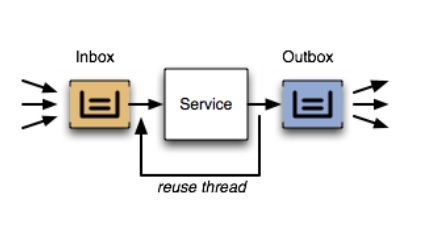 It is a single-threaded service that batches write requests to Lucene for added efficiency. As load increases, LuceneWriter becomes more efficient, because the write batch sizes increase automatically as we will see below. 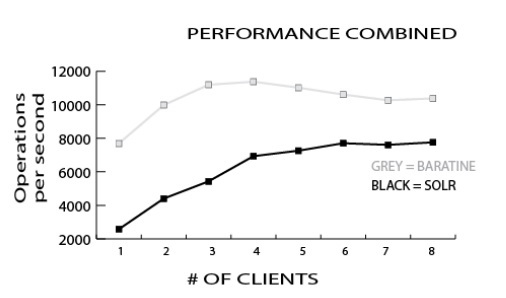 Clients can call these methods directly. We know that a service is at a URL, so how do we create a client to talk to that service? Long-lived clients, like a Java app-server or Node.js service, can share a single thread-safe connection, because the protocol is asynchronous, using messages. Fast requests, like searching a memory cache, can complete out-of-order before earlier slow requests, for example, a Lucene search that calls a MySQL database. Using a single connection can even improve efficiency, because multiple calls can be batched, improving TCP performance. For the Lucene example, the API includes methods to search for a text document and to add new documents to the search engine. Baratine implements interfaces as classes, allowing us to call methods directly on any interface we choose to expose. The Result of a call is a callback, that will return the result of the search or notify that the index has completed. Since Baratine is asynchronous, the call to search or indexText does not block. Baratine supports creating a websocket connection from a client to the calling service. This allows full duplex communication over a single TCP connection, as websockets aim to bring native desktop responsiveness to web services. First, a new connection is created with a new Jamp.BaratineClient at the server's HTTP URL, which is “http://localhost:8085/s/lucene”. Typically, the client will be a long-lived, used for many requests. Search is straightforward, proxying requests directly to the backend. Indexing text is implemented as a non-blocking method. Services are exposed by way of Baratine: creating a Bean that is managed by Baratine. The client call looks like a plain Java method call, as in the code below. Since the ServiceClient is thread-safe and can be used for multiple Baratine services, it can be used as a singleton. In fact, because of Baratine's internal batching and messaging, it's more efficient to use a single client shared across threads. As you can see, client creation is straightforward as Baratine’s flexible architecture allows efficient API protocol design. For the Lucene server, the reads and writes are split into two services because reads and writes behave differently, thus the services are customized to effectively support those differences. Writes benefit from a single writer thread, which improves efficiency under heavy load because it can batch multiple writes into a single commit. Reads for Lucene can benefit from multiple reader threads. Lucene searches can potentially block on a database query, tying up the thread. With multiple threads, a separate thread can process a new search. Note that the multiple threads are only required because Lucene might use a slow, blocking service. If Lucene were memory-based, or asynchronous itself, a single reader thread would be more efficient because of CPU caching. The implementation of the Lucene service is contained in five major files, which we'll describe briefly. The client API is implemented by the LuceneFacade Baratine service. It primarily dispatches requests to the Reader and Writer services. The facade will have a bigger role when we use multiple services to partition the Lucene server in a following article. For this example, it is useful to focus the client API on simplicity, making sure the server works to make the clients easier. Because the Lucene library is written as a singleton instance, the services for readers and writers share the same LuceneIndexBean. This design is based around Lucene's own design; we're using Baratine to work with the existing architecture, instead of trying to force Lucene to follow Baratine. If we were building a Baratine service from scratch, instead of adapting an existing library, we would likely choose a different architecture. The shared LuceneIndexBean singleton is injected into the reader and writer services when they are initialized. The Writer service takes requests from the facade and updates Lucene's indexes. It has a single worker thread that writes updates to Lucene for as many requests as its inbox has. When its inbox is empty, it calls Lucene's commit method to complete the writes. Under heavy load, the inbox will have more requests, which leads to a bigger batch, improving performance. Because Lucene's searches can block while waiting for a slow database, and because Lucene is multithreaded, the reader implementation uses a @Worker annotation to request multiple threads for the service. By annotating this service with @Workers(20) we provide a thread pool executor that can continuously dispatch threads to the reading service. Since the threads are only dispatched when needed, the multiple workers are low-cost. The multiple workers allows our Lucene service to serve multiple requests at once. In general, this multi-worker feature should only be used for gateway services with an external blocking dependency, like a database connection or a REST call. Services designed for Baratine should use a single worker, because they should be designed as asynchronous, non-blocking services. What we have done is implement the Lucene API as a set of Baratine Services. Within Baratine, every service lives at its own unique URL and operates under a single- threaded, single-owner/single-writer contract. (The multi-worker bridge service used in the Lucene readers is an exception; it is used to bring external libraries into Baratine.) Requests to the specific service URL are queued to that service’s inbox, which guarantees an ordering of requests as they are processed. Within Baratine, we have no need to add synchronization to our calls. Because each service is answered by only one thread, it is impossible for another thread to corrupt data that is being updated. This allows our classes to be POJO objects. As some readers might have noticed, our example is similar to Apache Solr, which provides a server for the Lucene library. Solr is a good comparison because it's a familiar example and can be compared to directly. We benchmarked against Apache Solr with multiple numbers of clients. 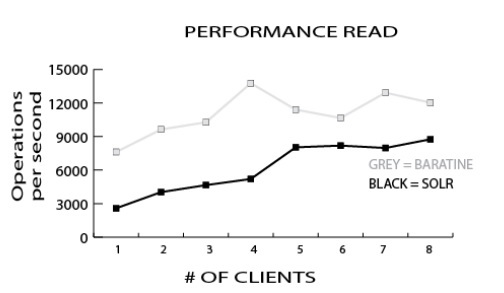 In testing against only reads, Baratine was better or within 20% of Solr’s performance. In a mixed read/write benchmark, Baratine proved to be 3x faster than Solr. As the results show, Baratine search (read) outperforms Apache Solr in a side by side comparison. A mixed load of read/write requests, show competitive numbers. What we have done for Lucene in this example can be done with any library or application. By wrapping a Baratine service as a facade into a library, we can transform any library (such as java.util) into an asynchronous service. Many of the principles Baratine includes are reflected in the reactive manifesto. 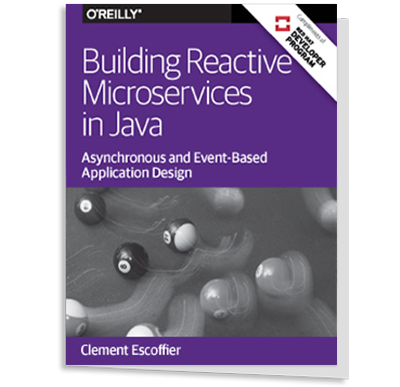 Reactive applications are elastic, responsive, resilient, and message-driven. It’s what is demanded by the Internet of Things, where tens of thousands of devices are connecting to the same application. These principles are coveted by developers, yet difficult to implement in practice. Baratine’s distinct POJO level abstraction defines a data and thread encapsulation level that absolves this difficulty. In this way, Baratine is a SOA implementation of a reactive platform that keeps developers programming in the object-oriented fashion they are used to. We believe that most new web applications will incorporate these principles while needing integration with their current systems. Thus, as we have shown in this article, Baratine is a perfect fit for building both. Baratine's value increases as you add functionality to the application. If for example, we decide to run live analytics on the queries being performed, a simple POJO class gathering statistics can be deployed on a Baratine Node and relay this information. It can provide this information as near real time coming from the current updates of the BFS (Baratine File System), or it can precompute and batch these results to an outside source for consumption. Either way, Baratine’s unified yet flexible architecture allows the system to be designed specifically for the task at hand without limiting future potential. Because services always embellish the qualities of a web application, proof of concepts can go from white board APIs to deployed state in a matter of minutes. Baratine is currently in Beta (0.10), with a scheduled roadmap to have a production ready version launched Q1 2016. In this example, we’ve only touched on the capabilities of Baratine backing a Lucene microservice. Stay tuned for Part Two, as we tackle sharding and scaling this Lucene microservice within Baratine! Sean Wiley is the Technical Evangelist and Senior Sales Engineer for Caucho Technology. Sean engages with both the sales and engineering teams to facilitate adaption of technology. He provides technical training, documentation, and implementation details for clients. Previous to Caucho, Sean worked as an IT Analyst at Cisco and Database Programmer for the Scripps Institution of Oceanography. He holds a B.S. in Computer Science from the University of California San Diego. To make it work I settled on a specific "recent" version of lucene and tika - 5.4.0 and 1.9 respectively. Modified service/pom.xml accordingly (replacing all occurrences of "[5.2,)" with "5.4.0" and "[1.9,)" with "1.9"). Now install.sh works. Pointing my browser to localhost:8085 just results in "404 Not Found". Pointing it at localhost:8085/s/lucene is better. But point it to file:///<lucene-plugin-checkout-root>/lucene-plugin/client/src/web/index.html (using localhost:8085/s/lucene) is where the fun starts.